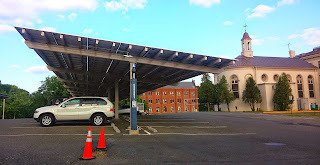 On May 13, John Finnerty at Standard Solar gave me a tour of the O’Boyle Hall Carports at Catholic University (CUA). We've seen stuff like this before. Remember the 841 covered parking spaces at Fedex Field? John's been at Standard Solar for six years and the company's been around for eight. Many solar groups in DC focus on advocacy or tech whereas Standard Solar focuses on finding strong financial partnerships. For example, Standard has a symbiotic relationship with Washington Gas--Washington Gas needs to meet a certain amount of renewable energy standard (RES) requirements and Standard Solar benefits from the co-payments of Washington Gas. There are seven sites on CUA's campus with solar resulting in a max capacity of 677 kW (4 times the carport). You can view more about CUA's real-time solar energy production here: http://bit.ly/1EOtPVe.